The Muppets are never mean to anyone. Jason Segel has said this quote in practically every interview and it really stands out as the soul of this movie. 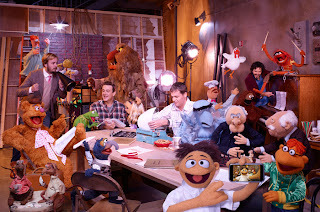 This is not cynical or ironic, these are the Muppets in all their surreal slightly vaudevillian and silly glory. As candy coated and fancy free as the exterior of the film is there is a deep sense of nostalgia and loss for that which is what we had. It is an interesting blend of melancholy and joy that weaves throughout as the Muppets attempt to recapture the magic they had in their heyday. The film succeeds first and foremost as great family entertainment, with a glowing stamp of approval from junior columnist RC. This is a film that knows what it is. Bobin and Segel keep it set just outside the real world where music numbers and Muppets are commonplace. Also they are constantly breaking the fourth wall with some witty one liners. Like the best family entertainment there are some heavy themes here, such as finding your place in the modern world or being able to recognize true love. Whether that is the romance between a frog and a pig or the love of entertaining trumping your desire to be monetarily successful, such as Grover giving up his place as the head of a company. One of my favorite bits involves Animal giving up the drums in order to control his anger. This idea that stability is achieved at the cost of your true passion is a great metaphor for the artist and a strong thematic point for an otherwise light film. But everyone has this arc as we see each of the Muppets rediscover the bliss they achieve when performing and working together. Perhaps the films greatest achievement is making Kermit an actual complex character. Kermit is the man. He is the lynchpin that can hold everything together and the only person capable of getting everyone back for one last show. I'll be honest and say it's been awhile since I've seen one of the Muppet films, but I never remember Kermit being this complex of a character. When we first see him he is visibly worn down living alone in a house that is far too big for him. The first song he sings as he walks up a hallway reminiscing is heartbreaking and we see that he is actually scared to embark on this journey because he actually has doubt that he can do it. For the first time I really believe that he cares about Miss Piggy as much as she loves him, and seeing Kermit grow as a character is one of the most accomplished bits of writing I've seen. I never thought I would see a film I'm which Kermit becomes humbled and attempts to regain his confidence. 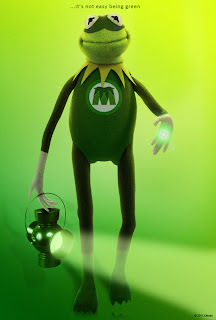 By the end of the movie we see Kermit in full on MC mode as he leads the Muppets in a wonderfully modern version of their show. Segel does an amazing job at keeping the script a mixture of homage and full blown Muppet zaniness. Like The Artist honors silent films and is a great silent film in its own right this is a brilliant love letter to the Muppets while being an amazing Muppet film itself. We all know I'm the optimist of this crew but aside from Amy Adams’ out of nowhere solo I can't imagine anyone not enjoying this incredibly entertaining film. They manage to keep it positive and happy and bright without ever being coy. A great family film and a great film in general. Here's hoping our children will now get the chance to experience further adventures of the Muppets. One last thought - this film and Hugo(my review should be up shortly) both push past post modernism and venture into nostalgia reminding us of a time without cynicism and when filmmakers truly were magicians who achieved the impossible where people could travel by map and take rocket trips to the moon. If this is the direction family film is going then RC is in for a wonderful cinematic upbringing.